Dental implants provide a long-term solution to replacing a single missing tooth or multiple missing teeth. We not only replace your tooth, we make sure it looks great by using a natural looking crown to cover your long-lasting titanium root. Dental Implants are strong and stable functioning like a natural tooth. Dental Implants have a more predictable outcome and are the treatment choice for replacing missing teeth. No more removing your teeth, slurring your speech or limiting your food choices. The best bridges and dentures only last five to ten years. Dental Implants can easily last a lifetime. We offer our WeCare Wellness Plan to our patients. We offer financing plans that may assist in paying for treatments and procedures at reasonable rates. The old solution was bulky and uncomfortable bridges or dentures. Today, we can use Dental Implants to replace a single tooth or more. The first step to perfect implants is the perfect plan. Utilizing CBCT, we are able to achieve the most accurate results. Implant surgery is done safer and faster because the technique allows us to visualize anatomy. This is key to our one-day implants. A cone beam CT scan is the product of a special type of x-ray equipment, used when dental work beyond the norm is required. CBCT is so effective because it produces 3-D images of your teeth, soft tissues, nerve pathways and bone in a single, 20-40 second scan. Through three-dimensional imaging, we can envision both the patients’ surgical process and final results to a much higher level than before. During a cone beam CT, an x-ray beam in the shape of a cone is moved around the patient to produce a large number of images, also called views. The high-quality images can be reconstructed to create a single 3-D image. CT scanning is painless, noninvasive and without side effects. Available right within Darby Dental Smiles’ office, the cone beam CT is usually performed to evaluate abnormalities of the jaw, dentition, bony structures of the face, nasal cavity and sinuses. In our case, CBCT allows us to create dental implants extremely specific to your mouth. Contact our Mechanicsburg office today to see how this great resource can aid you in your dental goals. Many of our patients struggle with the embarrassment of slipping dentures, the disappointment of avoiding favorite foods, and the problems with messy denture adhesives. All-On-4 is a quick, minimally-invasive way to replace an entire arch in your mouth. This concept is widely documented as the best solution for full-arch treatment. As its name hints, All-On-4 denture replacements attach to four dental implant abutments within the mouth. Quite possibly its biggest benefit, All-On-4 offers a fixed full-arch prosthesis on the day of surgery, providing immediate function. 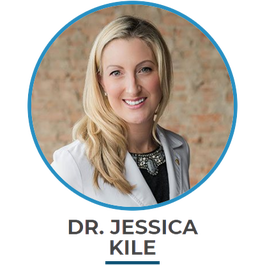 Relying on simply local anesthesia, discomfort is usually minor and temporary. We may prescribe you pain relievers as needed. A soft diet will be required during the initial healing phase. All-On-4 is a graftless procedure, meaning bone grafting is avoided. The implants utilize already available bone. Low cost and an improvement in quality of life are major advantages of acrylic based All-On-4 implants. Check in with the specialists at Darby Dental Smiles in Mechanicsburg to discuss how All-On-4 implants can enhance your smile. A large number of people do not visit the dentist because of anxiety. At Darby Dental Smiles, we want all of our patients to experience safe, anxiety free dentistry. With that in mind we offer a variety of sedation options to make sure that you feel relaxed. I.V. sedation – intravenous sedation uses a method of directly injecting sedatives into the bloodstream and help patients feel like they slept through the procedure. I.V. sedation is used for severe anxiety or when the appointment goal is to accomplish a lot in a single appointment. Oral Conscious Sedation helps you achieve a conscious yet extremely relaxed state during your dental treatment. By taking a prescribed pill before the appointment it helps you reach a moderate level of sedation. Although awake our patients report they often can’t remember much of the appointment including the sounds, smells, and any pain they may have felt otherwise. Nitrous Oxide or Laughing Gas is a mild sedative delivered in a gas form through a small mask that the patient wears over the nose. It can help you relax during your procedure while remaining completely responsive and alert. Do you dread the injection? Our office uses technology that takes away the sting of the anesthetic that you’re used to. We specialize in painless injections, you won’t even feel you’ve had a shot. Relax through your appointment by watching a show on Netflix and using our over-the-ear headphones to make the appointment fly by. Many procedures that in the past took a scalpel are now completed with a painless laser that helps our team deliver efficient comfortable dentistry. See how Darby Dental works with patients who need implants for dentures. See how Darby Dental works with patients who need implants from missing teeth. One of our patients shares her dental implant experience with us. All-on-four or All-on-six dental implants allow for a whole arch of teeth to be replaced with implants. They feel the closest to chewing with natural teeth, they are rigid and stable for chewing function and they are able to be made extremely aesthetic. 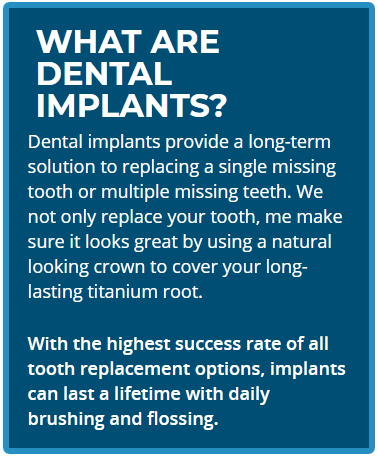 If you are missing a single tooth, an implant is the perfect way to replace both the tooth and the root. It looks and functions like a natural tooth, without sacrificing the health of neighboring teeth. 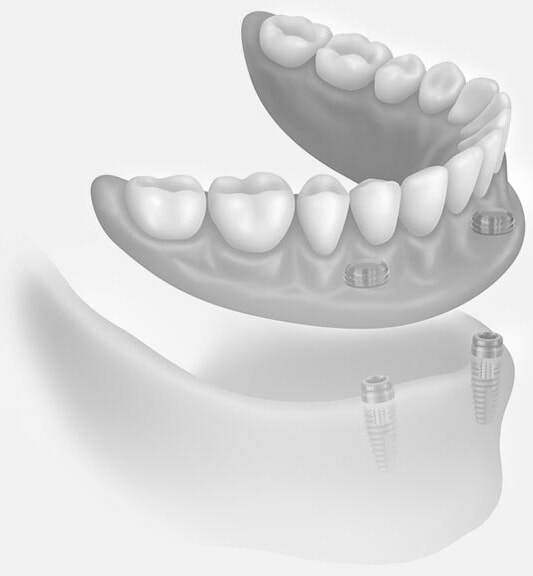 Dental implant supported bridges are an ideal solution for patients missing consecutive teeth. They perform better and last longer than traditional partial dentures or bridges. For patients who struggle with denture retention, stabilizing your dentures with implants is a great solution. Supporting the denture by installing two or more implants significantly improves stability and chewing ability. Implant retained dentures are the perfect solution for all our denture wearing patients. Before the invention of implants, a patient who had lost all of their teeth was limited to wearing complete dentures. However, the stability and retention of those dentures was often times unpredictable. The way they fit and ability to function like natural teeth becomes less and less efficient with age.